I did a series of paintings years ago based on the poetry of Los Angeles “Noir Poet,” Suzanne Lummis. I have always been inspired by the visual imagery that arises from reading good poetry. In this case, Suzanne saw a painting I did based on one of her poems and then wrote a poem based on that painting. It turned in to art influencing art influencing art! 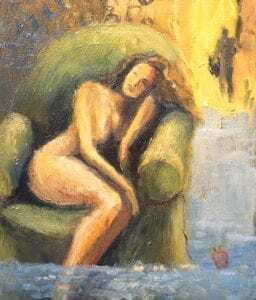 This poem, “Woman and Apple,” is now part of an anthology of poems influenced by many of the arts (painting, film, literature, photography and more). 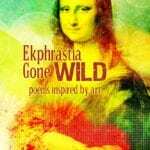 It’s called, Ekphrastia Gone Wild: Poems Inspired by Art. This includes the work of 87 poets from all over the world and is edited by Los Angeles poet Rick Lupert. The amazingly talented singer/songwriter, Leslie Satcher, performed at McCampbell’s clients’ beautiful home on the slopes of Deer Valley ski resort in Park City, Utah July 14, 2013. The evening’s focus was to celebrate the commissioned painting Rachael created for her clients called, “We Rise to Play a Greater Part 2.” It’s a triptych that measures 14′ long and 4′ high. The two central horses depicted are the clients’ Kentucky thoroughbreds running across a Scottsdale, Arizona sky. The commissioned painting, “We Rise to Play A Greater Part 2,” oil on canvas, triptych, 14′ wide x 4′ high. Due to a scheduled event, these two paintings had to go from conception, sketches, full size mock-ups, to final work in about a month’s time. Whew! McCampbell’s Fine Art Note cards fresh off the press!! My fine art note cards are now available. I have two sets of note cards for sale now in Nashville and Knoxville. 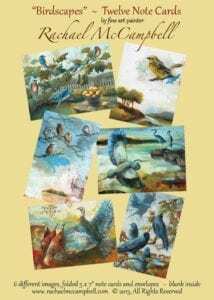 One set has images of my “Birdscape” paintings and the other set has “Bird Portraits.” There are 12 cards (5″ x 7″) in each set and they are blank on the inside. 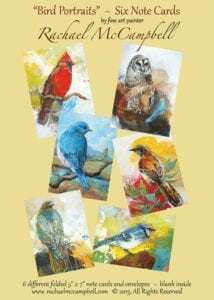 These are all Tennessee birds by a Tennessee artist! They are really high quality cards printed locally in Nashville. The envelopes are 100% recycled material. Additionally, I have original work, large Giclee Prints and the note cards at Cheekwood Museum Gift Shop. Continue reading McCampbell’s Fine Art Note cards fresh off the press!! There are catalogues of my exhibit, “Women in Mythology: The Power of the Feminine in Ancient Tales,” that was shown at The Parthenon Museum, Nashville, TN, July – November 2010. 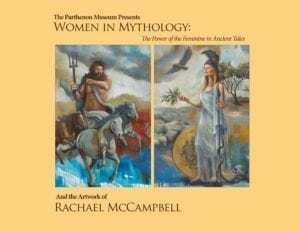 The text was written by Nashville Educator (MBA), Anne Christeson, and the art was my solo show of large-scaled paintings of Greek Goddesses. This show was generously unwritten by SunTrust Bank and an anonymous donor. Please visit the Parthenon Museum Gift Shop to purchase these catalogues. 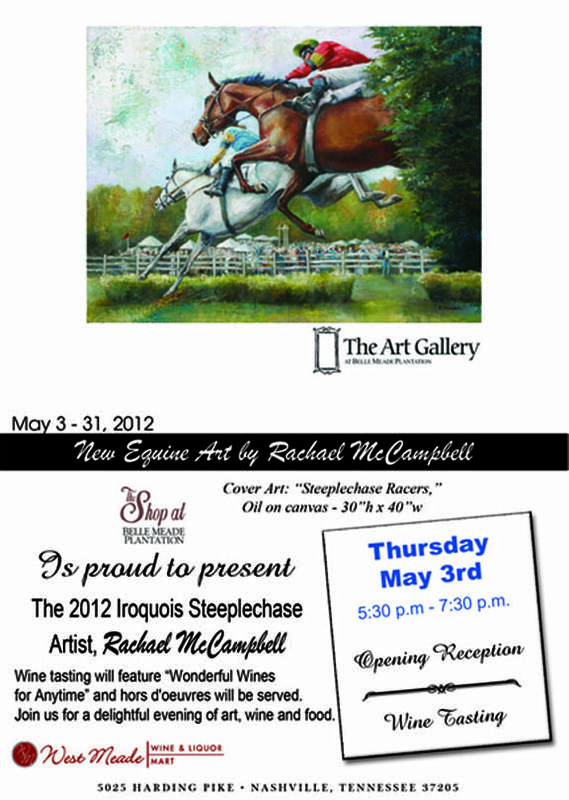 Rachael McCampbell was the featured artist for the 2012 Steeplechase. This interview was at Rachael’s studio in Leiper’s Fork, TN for Channel 4 news, Better Segment, (WSMV Nashville) April 30, 2012 with Kacy Hagerty. 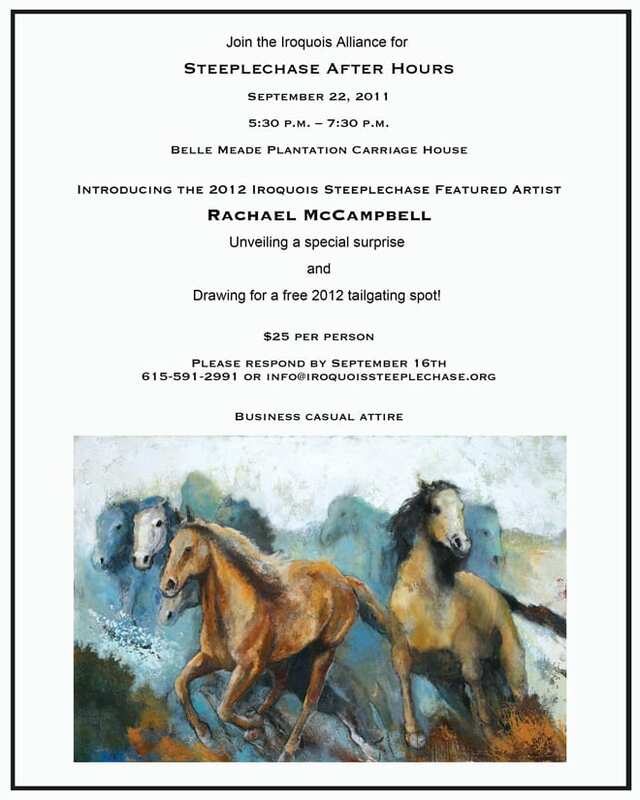 Please join us at Belle Meade Plantation for an art reception of my new equine paintings. The Iroquois Steeplechase painting for 2012 will be there with collectable posters for sale that benefit the Steeplechase organization. I will be happy to personalize and sign the posters as per your requests. 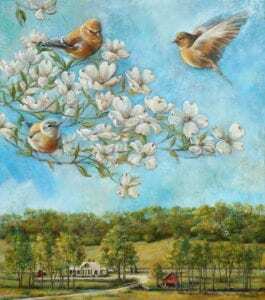 (Note: the Steeplechase painting will be auctioned May 11th and the Jockey Club Party the night before Steeplechase, but if you are interested in purchasing it, and cannot attend the Jockey Club event, you can leave a silent bid with the Steeplechase director, Libby Cheek: 615–591-2991. A portion of this sale benefits Vanderbilt Children’s Hospital. McCampbell New Steeplechase Artist 2012! “We are delighted to work with such a talented local artist who shares our passion for equestrian art, and look forward to sharing her work with the community,” said Dwight Hall, chairman of the Iroquois Steeplechase Race Committee. Continue reading McCampbell New Steeplechase Artist 2012! 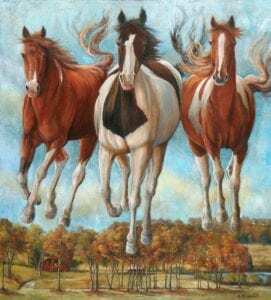 McCampbell’s Art on Cover of Horses in Art Magazine! 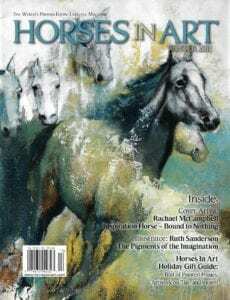 I was so honored to have an article written about my equine art and to be chosen for the cover of Horses in Art Magazine. To read the full article, please go to my “About” page and “Press” below that. Thank you Horses in Art!!! Please join us for the Steeplechase After Hours event on Thursday September 22, 2011 at the Belle Meade Plantation Carriage House in Nashville, TN. The Iroquois Steeplechase Organization is serving light Hors d’Oeuvres and cocktails from 5:30 – 7:30. Cost is $25 per person. New equine art by Rachael McCampbell will be part of this event.